Breaking Bad. Breaking Vegas Code. Not everything that happens in Vegas has to stay in Vegas. I’m going to let you in on a little secret. I’m going to share a little something from my girl’s trip to Vegas last weekend. It was a little out there, out of the expected/ordinary, for us at least. It started with the three of us playing Scrabble on the flight there, and ended with us reminiscing about the trip highlights on the flight back. In between the flights, there was ample time for craziness, which will stay in Vegas. For me, the most memorable parts were the random conversations with me pals, Karolina and Kerri. In one conversation, I learned a life-changing laundering tip: wash socks separately to prevent pilling of other clothes. In another, the one that still has me thinking, Kerri shared how some of her other friends were surprised to learn that the three of us are still friends after 10 years (we met at work), let alone taking vacations together. Taking a trip with anyone is a true test of the relationship, and our friendships have enjoyed many trips. Kerri commented that the longevity of our friendships was because we are all committed to keeping in touch, and simply making it work. Over the decade, we have each taken different paths in life, but share common goals: be happy, and live and let live. We want the best for each other. There’s no competition (unless it’s to compare my buffness to Karolina’s, and then it’s game on), no judgements (unless it’s to say an outfit looks terrible), and no gossiping (unless it’s to devise a plan to embarrass the other). Kerri is married (to the epitome of the perfect man) with two young kids. Karolina is the hardest working single mom (just call her a superwoman with all her commitments/successes). Me, I am the infamously single professional student who selfishly vacations whenever possible. We are three genuinely happy people. Our friendships work as a group and individually because we mutually respect each other, our commitments, and quirks/preferences. No excuses, no lies, no shadiness. We make time for each other. For instance, Kerri and I regularly meet for breakfast bright and early at 8.30am on Sundays, and Karolina will drop by for dinner on her way home when she has an hour to spare. If someone is willing to make any time for me, I’ll take it. I’ve learned (one too many times) that not everyone is worth my efforts. If you don’t care, I don’t care. Actually, I do care; I just don’t want to be the one that cares more. And, I think a key element to our friendship is that we actually create new memories rather than reminiscing about what once was. We continue to grow together. The annual girl’s trip is a prime example of this. Every year it gets better and better because it’s always evolving. Like, compared to the recent mellow trip, on our first trip, I can’t believe we … you didn’t think I’d actually finish that sentence, did you? 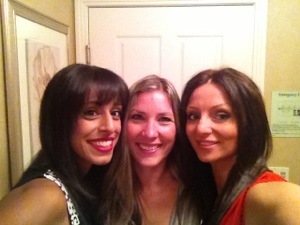 These women have been two of my longest friends. I know that friendships are defined by quality, not quanity. But finding quality and quantity (times two!) is pretty amazing. Cheers to the next vacation, ladies. Cheers to high heels and itty bitty dresses. Cheers to attempted escalator jumps in high heels and a itty bitty dress … I’ve already said too much. (1) Never force yourself into someone’s life. If you matter, they will create time/space for you. (2) Friends know your best stories. Good friends live them with you. (3) The only way to have a friend is to be a friend.